La Garrigue opened in 2001. Largely inspired by my country upbringing in Languedoc, La Garrigue offers rustic family style cooking, complimented by a large selection of the best wines from this area of France known as "Le Midi". It features rustic Tim Stead tables and chairs as well as original paintings by Andrew Walker from my home town Bedarieux and my village Combret. The restaurant is themed around the Languedoc food and wines and is a cross between an up market restaurant and a bistro we will give you that "Je ne sais quoi" experience. Gordon Ramsay's favourite French bistro and The Good Food Guide restaurant of the year in 2010. The perfect venue for private lunch or dinner; can also accommodate larger functions up to 50 people. The restaurant has great views of Calton Hill and is minutes from Waverley Train Station and the famous Royal Mile.I look forward to welcoming you. Reserve your table now and have your booking confirmed instantly. Join us for Valentine and indulge your partner with our special menu. We've consistently had a really excellent time on our tours to the vineyards and restaurants of Languedoc. The feedback from our wine aficionados is always positive ranging from "the best holiday we ever had” to “embarrassingly under priced”. Click for more details. La Garrigue WON the award for 'Best Restaurant/Wine List for French Wine' in the France Summit held on 22nd October in London. La Garrigue was nominated along with 'Le Manoir aux Quat'Saisons' and 'Hotel TerraVina' owned by Raymond Blanc OBE and Gerard Basset OBE respectively. Mr Basset is also the current 'Best Sommelier in the World' and co-founded Hotel du Vin. We are thrilled to have been recognised for our efforts in promoting the wine of Languedoc and want to take this opportunity to thank all our suppliers who have supported us over the years. Our gratitude also goes to all the wine makers, to our staff and, of course, our customers. La Garrigue hosted an evening for many of our well known friends to enjoy wine, nibbles and good company. We present our photo gallery. The third helping of this collection brimming with exciting recipes from a wealth of culinary talent - including La Garrigue. You can order online here or pop in and ask J-Michel to sign one for you. Andrew Walker, our resident artist who does the paintings from Combret and villages around Bedarieux, my home town, is having a big show in Paris. Take a look. The restaurant featured on the Channel Four programme with Gordon Ramsay. The pressure was intense both at 'home' and away in Gordon's place. A fantastic time was had by us all and we are delighted with the response from our dining friends both in their support and bookings. Thanks Gordon! Play Channel Four programme - this will open in a new window and is preceeded with an advert or two. 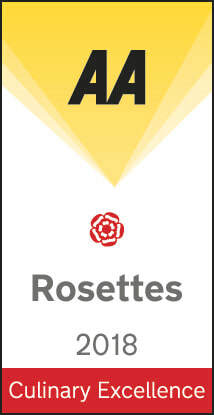 La Garrigue has again attained an AA ‘Notable Wine List’ Award that goes alongside our entry in the Restaurant Guide. The ‘Notable Wine List’ accolade is awarded to only 10% of restaurants their guide - just over 200 restaurants in the UK.